Observation - Crustose lichen on fruit tree bark - UK and Ireland. 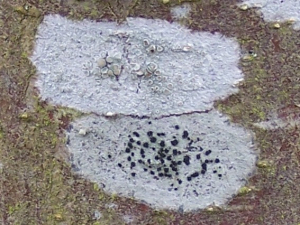 Description: Flattened, oval, white-grey lichen, with pale brown apotheca ('jam-tarts') with edges same colour as thallus. Flattened, oval, white-grey lichen, with pale brown apotheca ('jam-tarts') with edges same colour as thallus.